Viticulture: certified Organic (for now, anyway -- last time we saw him, HK was seriously pondering the merits of certification). Grapes: Spätburgunder, Grauburgunder, Weissburgunder, Pinot Noir. Terroirs: mainly loess, with a few vines on exposed volcanic soils. Holger and his wife Gabrielle started making wine in 1999. Like many in our band, the family story is singular. Holger grew up believing he didn't much like wine, yet he also grew up among vines, and there was a vaguely tacit understanding with his parents that one day he might take over the family vineyards in Bickensohl… At some point, in the course of his experiences working in wineschool, his stages at somewhat spooferic estates in Bordeaux and working for an importer in Frankfurt, Holger discovered that, actually, he did like wine -- quite a lot in fact -- but only if it met his very exacting standards. This led to some difficult decisions when he returned to Bickensohl to steer the Koch domain out of the local co-op and into the deep water of fine hooch: Holger was unhappy with the quality of the clones that dominate local viticulture, and with which his parents had recently replanted many of the vineyards at some expense. To cut a long story short, he knew that to make good wine he needed good material in the vineyard, and to those ends, much of the local Pinot Braun was not up to snuff. So the nettle was grasped, and most of the vineyards were replanted with Selection Massales from Alsace, Auxerrois or Burgundy, with only a few plots of old vines that were to Holger's satisfaction also making the cut. After a few years studying his land and getting a clear idea of what is best for his wines, he now makes the finest Pinots -- Noir, Blanc and Gris -- in Swabia. Holger's rules are simple. There is no dogma, just absolute pristine viticulture, and a belief in the idea that several days in the vineyard are preferable to a quick fix in the cellar, where Holger's touch is light indeed. Chaptalization and yeasting are viewed with suspicion, if not disdain (there was a sense of sorrow in his voice when Holger once informed us that he'd had to inoculate a cuvée to fix a fermentation that had gotten stuck from an overabundance of fructose), and the elevage of each wine is approached with a rare thoughtfulness and flexibility. The majority of the vineyards sit on Loess soil, a very sandy, easily breakable mix of pulverized limestone from long eroded mountains to the east and clay, at 250 meters above seal level. The mountain chain where the winery is located has one of the warmest climates of Germany. Indeed, after many years work restoring a disused volcanic vineyard (a pet project), Holger was dismayed to realized that the less exposed plots were too warm for Pinot Noir, and so after much deliberation, a little Syrah was planted. Though he professes to have no idea what he will do with the out of these vines, we can report that the small amount of a blend he made form the young Pinot and Syrah vines in this vineyard in 2014 was a delicious vin de soif. 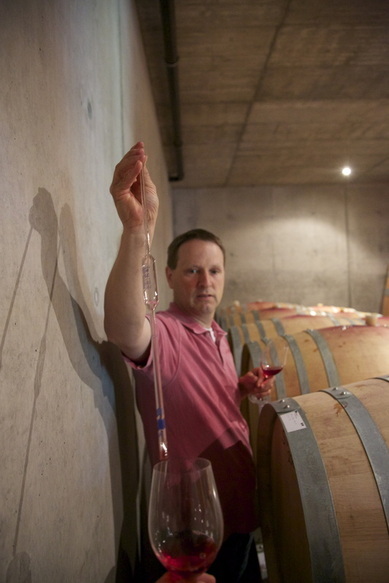 The Kochs divide their wines into three overall levels of quality. The Basics take the “Kaiserstuhl” designation. The whites, a Grau- and a Weißburgunder, are bottled under screwcap, and are fresh, vibrant, youthful, and are intended for early consumption The red Spätburgunder is predominantly old vine Pinot Noir from the best of the vines Holger inherited, along with a little young vine juice form his best sites. It is good to go out of the gate, crunch, fresh and pithy, but we have been impressed with its ability to age too. The village “Herrenstück” wines are more serious: long and complex, made mostly from selection massale parcels on the lower slopes above the village, these are wines that are eminently suitable for medium to long term aging. The Pinot Noir, which is all selection massale, is a fantastic expression of the terroir of Bickensohl. The wine is punchy and very very precise, and while it can age to reveal a heady black fruited richness, it never seems to lose the detail that serves to define it. Holger's Weißburgunder is not your momma's pinot blanc. This is a real terroir pinot, and marries its rich fruit with a crunchy, racy minerality that speaks not so quietly to you of the salty tang of the loess soils from whence it came. Finally, while the Grauburgunder is not your auntie May's pinot grigio, neither is it her french pen pal Gwendoline's Pinot Gris either. Pinot Gris vines in Bickensohl yield a wine of serious power, yet without the cloying residual sugar that bedevils far too much hooch made from this grape. In our experience, this is a wine that drinks well on release, than gets a little sullen for a while before finally blossoming. Foodwise, it makes a fun alternative to Chenin and Savagnin when it comes to thinking of a complementing serious over-indulgences on cheese. The Weißburgunder "Scheibenhardt" comes from a small, exposed vineyard that juts out spectacularly over the village of Bickensohl. There's something about this site that confers a particular delicacy to these wines: combined with the very alkaline soil, it serves to put one in mind of the pinot blanc one used to find in the Yonne, many moons ago. By contrast, the Weißburgunder ***, from vines in the natural amphitheatre occupied by the Eichbuck and Halbuck vineyards (the grand crus of Bickensohl) are more powerful and intense, putting one in mind of those plots of pinot blanc that still hold out in Aloxe and Pernand. These ***s are epic wines, and serve to remind one of the insanity that decreed that so many great French sites that built their reputation on this cepage must now replant with Chardonnay when the old vines fall out of production. The Grauburgunder *** is a wine that, to be perfectly frank, we are still getting our heads around. On first release, it is actually more accessible than the Weißburgunder ***, and at this point, it is a wine that easily serves as a crowd pleaser for those hispters amongst us that secretly have a liking for fancy chardonnay (but don't want our friends to know). As its initial fruit recedes, the wine tends to go a little dumb, before re-emerging in its own very singular form, which is a powerful dry Grauburgunder from the loess soils of Bickensohl. This latter beast is quite unique -- very mineral, and with powerful, slightly herbacious fruit. It tastes *nothing* like chardonnay at all. As we said earlier, this is something we are still getting our heads around. The Pinot Noir * comes from a specific plot of selection massale vines in the lower part of the Halbuck vineyard above the winery. This is usually the most red fruited and delicate of Holger's Pinot Noirs. Though well fruited, this is a wine that trades in nuance and transparency. As we mentioned earlier, Holger is not enamoured of Chaptalization, and in our experience, the "one star" is deliciously svelte and fruity on release, after which it is wont to shut down for a year or so, before remerging as something more nuanced and complex. The Pinot Noir *** comes in turn from the upper portion of the Halbuck. The covering of the loess atop the rock here is thinner, and the site is more exposed. The resultant wine is far darker than the one star: it adds a tertiary, slightly ferrous core and a deal more power to its fruit. This is seriously great Pinot.